When I first started consulting, reputation management was mostly geared towards national brands, C-suite executives, politicians, and celebrities. But now that reputation management is becoming increasingly important on the local SEO level, I’ve been receiving a lot more inquiries from small business owners. Most of them contact me because they need help suppressing negative reviews in search results. The other day, I received a call from a potential client who wanted to know what it would cost to help him improve his reputation on Google and Yelp. I explained to him how the process worked, and provided him with a quote. The next day, he emailed me, thanking me for going over the details with him, but said he wouldn’t be able to move forward because he felt it wasn’t worth the cost. In his defense, there is some truth to this. Statistically speaking, Millennials are indeed more likely to be influenced by customer reviews, when compared to previous generations. According to Adweek, 93 percent of Millennials search for customer reviews before making a purchase. Millennials are also more likely to review businesses online, and they tend to be the most critical. But Millennials aren’t the only ones who rely on customer reviews. According to Pew Research data, 34 percent of adults ages 50-64 said that they always check customer reviews before buying something for the first time. Even when looking at the 65+ age group, nearly 1 in 4 regularly check customer reviews. 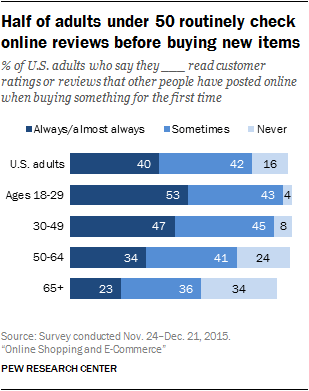 Overall, 82 percent of all U.S. adults said they at least sometimes look at reviews before making a purchase. Online Reviews Are Important. Period. 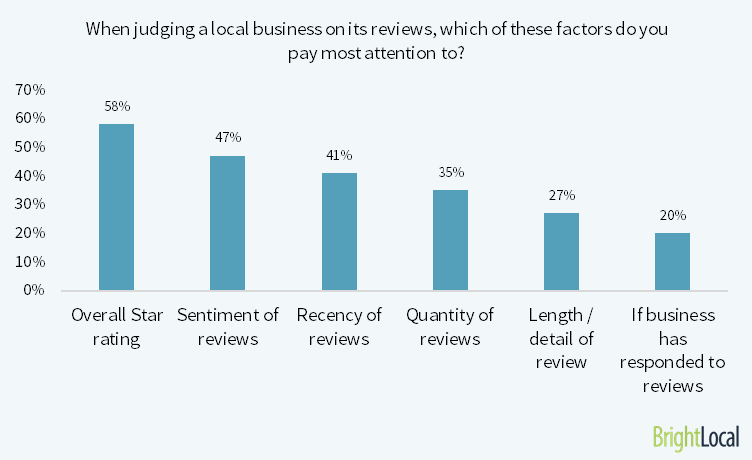 Online reviews have become the Achilles heel of local businesses. What people say about your business matters. I’ve seen clients lose 40 percent of their organic traffic, after a customer left a 1-star review, and tanked their average rating. I’ve even seen negative reviews force local businesses to close their doors for good. It isn’t fair, but it’s the harsh reality of owning a business in the digital age. Regardless which industry you’re in or which demographic you’re targeting, consumer trust in online reviews has improved significantly over the past few years. In fact, a 2016 survey showed that most consumers trust online reviews just as much as personal recommendations from their friends and family. It’s a simple concept, but simple doesn’t always mean easy. Most business owners don’t know where to begin. It can be extremely frustrating dealing with negative reviews, and getting positive reviews to stick is a special kind of hell, even if you know what you’re doing. Businesses spend thousands of dollars on web design, SEO, and reputation management, yet very few invest in optimizing the customer experience. There’s no way to guarantee 100 percent customer satisfaction, but there are a few things businesses can do to optimize the customer experience, and significantly reduce the likelihood of negative reviews. A good place to start is sifting through the negative reviews and determining which aspects of your business are falling short of your customer’s expectations. When working with clients, I like to bucket these pain points into different categories. Then I’ll compile a list of the most commonly cited issues, and we’ll use those as a starting point. Most businesses can’t afford to reduce their prices. But the other four complaints could have been easily avoided. If there’s any silver lining to negative reviews, it’s that they help business owners see which specific aspects of their business they need to work on, to improve the customer experience. In addition to digging into what customers are saying about your own business, it can also be helpful to know what customers are saying about your competitors. Using Yelp, Google Reviews, and other review platforms, you can learn about the things that customers like most about your competition, and the things that they dislike. When comparing review metrics, pay close attention to the overall star rating and the sentiment of reviews. According to BrightLocal, consumers trust quality over quantity. When a business responds to a customer review – be it positive or negative – it shows that the business truly cares about the customer and their experience. Not only can this help to resolve a customer’s complaint, but it also shows other potential customers that management is responsive and accommodating. My uncle always used to say, “when you make a mistake, own it, learn from it, and move on.” This is exactly how businesses should approach customer feedback. Don’t use it as opportunity to prove a point, or make excuses, because in most cases, that will backfire. Instead, try to empathize with the customer, and treat them the way that you would want to be treated if you were in their shoes. It’s important to check in with customers regularly to ensure that their experience is on par with their expectations. This is easily the most effective way to reduce negative reviews. In most cases, if you can solve a customer’s issue right away, not only are they far less likely to write up a negative review, but because you went out of your way to improve their experience, they may be more inclined to leave a positive review. Reviews aside, management and employees should always make an effort to interact with customers as much as possible. Even if you run an online business, and never meet your customers face-to-face, it’s important to put yourself out there, even it’s just an email to check in and introduce yourself. It makes customers feel appreciated. When you show customers that you care about their experience, you can increase the likelihood of referrals and repeat business, and in some cases you may prevent a nasty review. One of the main challenges businesses face is that customers are much more likely to leave a review when they have a bad experience, than when they have a positive one. This is mostly due to how we perceive and react to gains and losses (a.k.a. “loss aversion”). In economics, loss aversion is a theory that suggests a person who loses $20 will lose more satisfaction than someone would gain if they were given $20. When you consider how loss aversion impacts the consumer’s perspective, it makes a lot of sense why it’s so difficult for businesses to rack up positive reviews. When we go out to eat at a local restaurant, our general expectation is that the experience will be a positive one. No one goes out to eat expecting a bad meal or slow service. Whether we realize it or not, we’ve already set the bar, and anything that falls short of our expectations will ultimately result in a poor experience. This can be a slippery slope for businesses, because even the slightest deviation from a customer’s expectations can ruin their entire experience. Which Review Sites are Most Important for My Business? Chances are if you were to do a Google search for your business name, several of these sites would appear on page one. 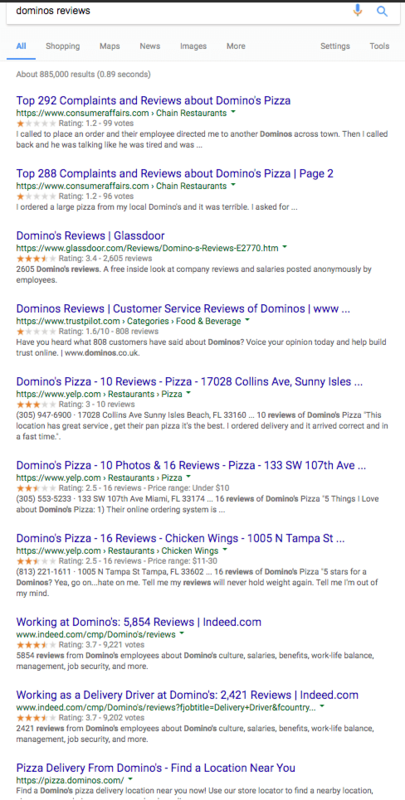 In some cases, these larger review sites can outrank the business website for branded search terms, such as “[Brand Name] + reviews” or “[Brand Name] + complaints.” Here’s a screenshot of the Google search results for “Dominos reviews.” Notice that the Dominos website appears at the very bottom of page one. Because these sites naturally tend to rank well, it can be very challenging to suppress them in search results. That’s why it’s important for businesses to make a concerted effort to generate as many positive reviews as possible. In this post, we’ll focus on Google and Yelp, since these seem to be the most common sources of negative reviews, and they also happen to have the strictest criteria for getting reviews past their spam filters. Before businesses start asking customers for reviews, they should first familiarize themselves with the Google and Yelp review guidelines. Although Google and Yelp both advise against soliciting customer reviews, they have very different definitions as to what constitutes as solicitation. Yelp’s policy is pretty straightforward. Don’t write reviews for your own business or of competitors – our Content Guidelines prohibit it. Don’t offer freebies, discounts, or payment in exchange for reviews. Don’t work with companies offering to “fix your reviews”. Don’t ask anyone to write reviews of your business, that includes friends, family, and customers. Don’t pressure (or pay, or bully, or sue) people into changing or removing critical reviews. As you can see, Yelp is only interested in true, organic, unsolicited reviews. This means that business owners are not allowed to ask customers to leave a review on Yelp, nor are they allowed to coerce customers into removing negative reviews, or reward them for doing so. Yelp also warns against hiring companies offering to “fix your reviews.” As a reputation management consultant, I can tell you that anyone who says they can get negative reviews removed from Yelp is lying. Although I have seen certain scenarios where reviews were removed due to defamation or spam, these cases are few and far between, and tend to be very difficult to prove. Display Yelp’s branding to all of your customers; request some free Yelp signage, or show off your People Love Us On Yelp sticker if you’ve earned it! Embed your favorite reviews on your website, share them on Facebook and Twitter, and link back to your Yelp page. Tell your customers to “Find us on Yelp”, but be careful not to ask them for a review. 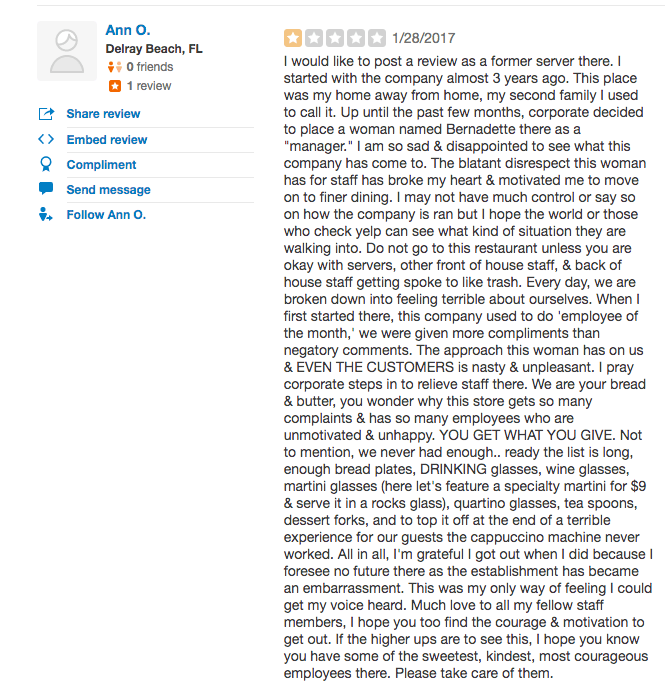 Quick recap: It’s ok to tell your customers that you’re on Yelp, but it’s not ok to ask them for a review. For obvious reasons, I’m not going to suggest that business owners ask customers to leave a review on Yelp, but I will say that if businesses are asking for reviews, it’s very important that they don’t incentivize customers in any way whatsoever. 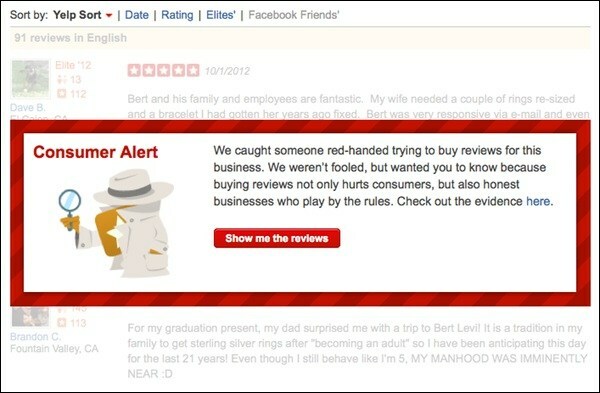 If Yelp finds out that your business is incentivizing reviews, they could slap a “Consumer Alert” notification on your profile, which would warn potential customers that your business has been caught buying reviews. Yelp even conducted an undercover sting operation back in 2012, to find businesses that were offering cash in exchange for customer reviews. Although incentivized reviews may seem like a good way to beef up your online reputation, the potential consequences simply aren’t worth it. If you want to play it safe, my recommendation is to refrain from asking customers to review your business on Yelp. Remind your customers to leave reviews. Let them know that it’s quick and easy to leave business reviews on mobile devices or desktop computers. In other words, business owners can reach out to individual customers and ask them to leave a review, however, it’s not advisable to send out review requests en masse, since these “wave” patterns could trigger Google’s spam filter. Both Yelp and Google use a variety of signals to detect and remove reviews that appear to be spam. The main issue is that the algorithms are far from perfect. As a result, legitimate, positive reviews are sometimes flagged as spam, and fake negative reviews can slip beneath the radar. This can be extremely frustrating for business owners, especially when negative reviews stick, and the positive reviews are hidden or removed. In my experience, it’s nearly impossible for new users to get positive reviews passed Yelp’s spam filter. In most cases, if a new user creates a Yelp account, and has left only one review (specifically a positive review), the review will be hidden and not factored into the overall star rating. I can’t definitively confirm that Yelp’s review filters are somewhat biased, since I don’t have any data to back it up. But based on what I’ve seen in my seven years consulting, that seems to be the general consensus among small business owners. Google uses automated spam detection measures to remove reviews that are probably spam. Although legitimate reviews are sometimes inappropriately removed, these spam prevention measures help improve people’s experiences on Google by ensuring that the reviews they see are authentic, relevant, and useful. What I find most interesting about Google’s review policies is that Google doesn’t have a problem with customers using aliases when leaving reviews. When a client came across a 1-star review from a customer whose name didn’t match anyone he’s ever worked with in the past, I reached out to the Google My Business support team to request that it be taken down. Google refused to remove the fake review because they “were unable to confirm if this user was actually a customer,” and they also told me that Google has no policy against anonymous reviews. Not only are businesses guilty until proven innocent, but their policies don’t even require customers to use their real name. Unlike Yelp, Google doesn’t seem to be too concerned with how many times a user has reviewed a business. I’ve seen many first-time reviewers slip through the spam filters. However, since Google accounts are used for much more than just reviews, they have access to a much wider range of user data, such as search and browsing activity, and the use of certain Google products, such as Gmail, calendars, and Google Drive. Like Yelp, Google users must be logged in to leave a customer review. This means that if a customer doesn’t already have a Gmail account, they will need to create one in order to leave a review. Providing that the customer takes the time to create an account, their review could still be flagged as spam, since Google may assume that the account was created for the sole purpose of leaving a review. If you’re beginning to feel like the deck is stacked against you, that’s because it probably is. Make it easy for customers – Make it easier for customers to leave a review by adding links within your website and email signature. Although Yelp advises against asking for reviews, their guidelines recommend letting your customers know that they can find you on Yelp. They also give businesses the option to handpick positive reviews to embed on their websites, with a direct link back to their Yelp profile. Providing you don’t explicitly ask for a review, you’re not violating Yelp’s guidelines. Since Google is a little bit more lenient, you could even add a link that says, “Review us on Google!” and include a direct link to leave a review. Target Gmail users – I’ll start by saying that it is NEVER a good idea to email blast customers asking for reviews. Not only is this considered solicitation, but if Google sees an unusually high influx of customer reviews within a short period of time, you can count on them being flagged as spam. However, if your business collects customer email addresses, you could always segment off the Gmail accounts, and follow up with them after they’ve made a purchase, asking them to leave a review. This will increase the likelihood of the review being published, since they already have an existing Google account. Create email drip campaigns to encourage reviews – Once again, we don’t want to blast a bunch of customers all at the same time. But businesses can create automated drip campaigns that deploy emails asking customers for reviews, depending on where they are in the sales process. This is a good way to gradually build legitimate reviews, without tripping Google’s spam filter. If you’re a business owner, don’t set up review stations or kiosks at your place of business just to ask for reviews written at your place of business. Keep in mind that Google is capable of tracking IP addresses, computer IDs, and geo-coordinates for logged in users, so it would be very difficult to make kiosk reviews appear organic.